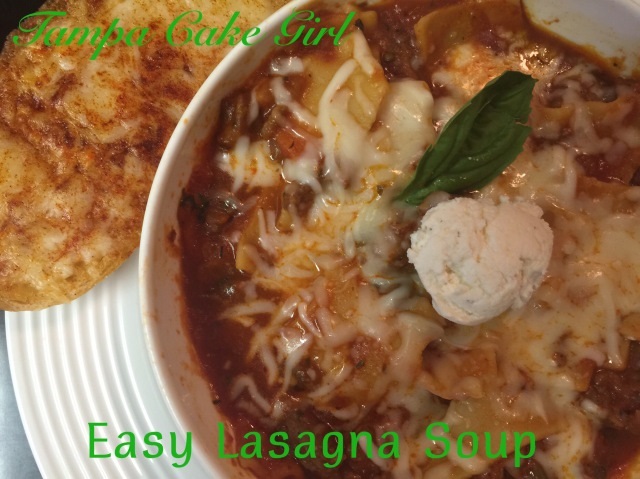 Easy lasagna soup recipe -has all the delicious flavors of homemade lasagna without all the work! The perfect weeknight dinner. 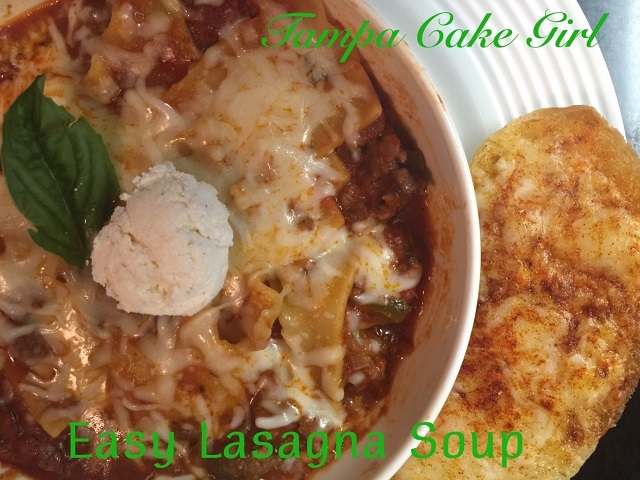 It’s snowing so much here and I am in the mood for a delicious soup, like this wonderful soup, Easy Lasagna Soup from my friend Cydnee, from Tampa Cake Girl. Cydnee and I have been online friends for years and finally met in person for the first time a couple weeks ago! We have a lot in common, we love food, so much that we blog about all of our favorite recipes. 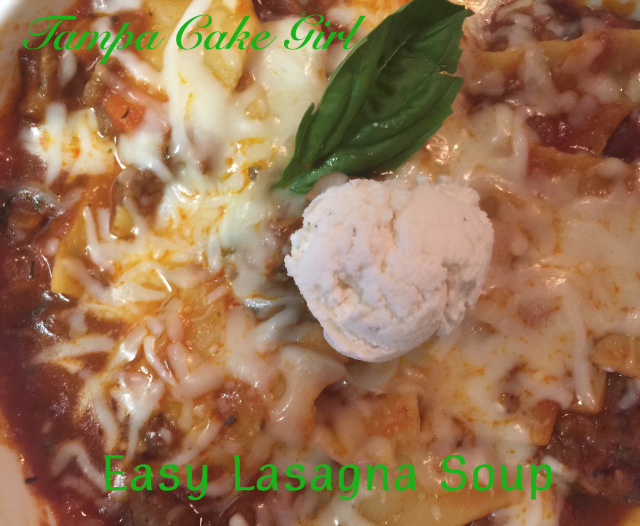 I am a huge Lasagna fan, so when Cydnee published this recipe, I was so excited to make it! If you love all the delicious Italian flavors like Italian sausage, pasta, tomatoes, garlic, basil, and CHEESE in a traditional lasagna, you are going to love this soup. It’s definitely a recipe to add to your menu this winter. This is an easy one-pot soup that is ready to eat in 30 minutes. Enjoy this soup with a salad and garlic bread and you have a great meal. The leftovers are even better! Brown sausage in a soup pot for 8 minutes, breaking it up as it cooks. Add onion, green pepper, and garlic. Cook an additional 5 minutes or so. Sausage should not be pink or red at this point. Pour in marinara sauce and beef broth. Add seasonings to the pot, bay leaves, chili flakes, Italian Seasoning, basil leaves, salt, and pepper. Bring to a boil, add lasagna noodles and cook until noodles are tender. I cooked mine about 13 minutes. Top with mozzarella cheese and a scoop of ricotta. This would be perfect with a salad and garlic bread for a meal. Brown sausage in a soup pot for 8 minutes, breaking it up as it cooks. Add onion, green pepper, and garlic. Cook an additional 5 minutes or so. Sausage should not be pink or red at this point. Pour in marinara sauce and beef broth. Add seasonings to the pot, bay leaves, chili flakes, Italian Seasoning, basil leaves, salt, and pepper. Bring to a boil, add lasagna noodles and cook until noodles are tender. I cooked mine about 13 minutes. Remove Bay Leaves. Serve soup into bowls. Top with mozzarella cheese and a scoop of ricotta. This would be perfect with a salad and garlic bread for a meal. Enjoy! Be sure to subscribe and follow on social, so you never miss a recipe! This sounds like such an amazing recipe for cold evenings. I love lasagna, and soup can be so comforting.